Harry, Ron and Hermione set out on their perilous mission to track down and destroy the secret to Voldemort’s immortality and destruction – the Horcruxes. On their own and on the run, the three friends must now rely on one another more than ever ... but Dark Forces in their midst threaten to tear them apart. Meanwhile the wizarding world has become a dangerous place. The long-feared war has begun and the Dark Lord has seized control of the Ministry of Magic and even Hogwarts, terrorizing and arresting all who might oppose him. The Chosen One has become the hunted one as the Death Eaters search for Harry with orders to bring him to Voldemort ... alive. With 2010’s Harry Potter and the Deathly Hallows - Part 1, the mega-successful franchise nears its end. In this one, budding wizard Harry Potter (Daniel Radcliffe) and this peers cut ties with the “muggle world” and prep for a final confrontation with evil Lord Voldemort (Ralph Fiennes). As part of this, Voldemort’s minions take control of the magical realms and render Potter and company renegades, as they can’t even take refuge at Hogwart’s any longer. To aide in their mission, Harry and pals Hermoine Granger (Emma Watson) and Ron Weasley (Rupert Grint) set out to locate items called Horcruxes; these represent Voldemort’s mortality and their destruction may offer the key to his defeat. Along the way, they discover the secret of the Deathly Hallows, items that also may assist in their quest. To some degree, the last few Potter films have suffered from the nature of the overall narrative arc. For so long, we’ve pointed toward the inevitable showdown between Harry and Voldemort that we threaten to become impatient. That was a factor in the prior couple of flicks, and it becomes even more prominent with Hallows. The movie doesn’t even pretend to stand alone; its very title lets us know that it’ll end in an incomplete fashion. Despite that, it feels like a satisfying tale, so don’t worry that it’ll leave you hanging in a frustrating manner. Sure, it makes us anxious to move ahead to the finale, but unlike some movies that come as part of a series, it doesn’t cause groans or a desire to throw tomatoes at the screen. So much happens here that a longer story would probably be too much; I definitely support the decision to split the tale into two movies, as any fears that part one would feel stretched out on incomplete failed to occur. Hallows definitely presents a good launch to the series’ climax. Earlier Potter flicks offered grim moments and themes, but not to the level found here. The movie makes it clear from the very start that silliness and whimsy will be in short supply this time. For the first time, our lead kids spend no time at Hogwarts, so we get no cute shenanigans on the grounds or teen beat romance ala the last film, Harry Potter and the Half Blood Prince. And it carries that feeling for virtually its entire running time. No, it doesn’t present unrelenting darkness; a few moments provide slight comic relief or other breaks in the tension. But these are organic and don’t feel like overt attempts to throw in gratuitous whimsy. They occur infrequently and meld well with the overall tone – and they’re probably necessary, as so much nastiness occurs that we can use the occasional breather. But not much of one, and that’s fine for me because I really like the film’s darker tone. I thought some of the earlier films were just a little too in love with all the cuteness of the Potter universe; even when many life or death events occurred, they never demonstrated much impact. That changed a bit over time – especially when we got to Goblet of Fire, the fourth film in the series and the first real appearance of Voldemort – and it clearly creates a major thrust in Hallows. Notable characters die and general sense of unpleasantness rules the day. Within the first few minutes, Voldemort tortures and kills an innocent victim – and then feeds her corpse to his snake! Combined with moving moments like Hermoine’s departure from her parents, the film hits us in the gut from the very start and never lets up on us. I’m pleased to see that Daniel Radcliffe’s progress as an actor continues here. During the first few films, I thought he was a weak link. He may have looked the part, but he lacked much personality and was overwhelmed by his more interesting co-stars, Watson and Grint. That’s changed – and changed quite a lot. Actually, Grint has developed well, too, but I think Watson never grew much in the Potter context. She was good when Hermoine was mostly a prissy little know-it-all, but as the role has grown, she’s appeared somewhat buried. She tends to look sad and scared a lot but not much else. On the other hand, Grint has taken a character who originally existed for comic relief and made him reasonably three-dimensional; Ron’s still something of a goof, but we can buy his emotional development. Radcliffe demonstrates the greatest growth of the bunch, though, partially because he had the farthest to go. As I mentioned, I thought he lacked much stage presence or skill in the earliest movies, but somewhere around Goblet he started to show actual acting talent. That progression continued over the next couple of films and reaches its peak to date in Hallows. The film throws many challenges at him, and he handles them all quite well. Radcliffe has gone from liability to strength. 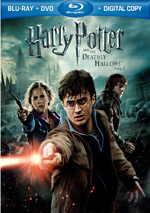 Harry Potter and the Deathly Hallows - Part 1 appears in an aspect ratio of approximately 2.40:1 on this Blu-Ray Disc. Though not a poor presentation, this one presented more problems than expected. Actually, my only real complaints stemmed from shadow detail. When we found low-light sequences – and those occurred quite often in this grim tale – the elements tended to be really dark. And I don’t mean “moody dark” – I mean “what the heck is going on?? ?” dark. During these shots, I found it awfully tough to tell what was happening. Some of this likely came from photographic choices, but I saw the movie theatrically and don’t recall having so much trouble being able to discern the action. Hallows offered a really dense image during its many low-light scenes. Everything else was perfectly solid. Sharpness seemed accurate and distinctive, without any hints of softness or fuzziness. Jagged edges and shimmering remained absent, and I saw no edge haloes or artifacts. The image also lacked print flaws. Colors weren’t much of a factor in this largely monochromatic piece. Even when potentially lively hues appeared – such as Umbridge’s pink outfit – they were low-key and subdued. Though not very exciting, that was appropriate and fine within the movie’s design. Blacks were deep and tight, so I had no complaints there. Unfortunately, those heavy shadows created a definite distraction and caused me to drop my grade to a “C+”. On the other hand, the film’s DTS-HD MA 5.1 soundtrack provided a consistent delight. One of the more action-oriented Potter films, Hallows boasted a lot of intense material that utilized all five speakers in an involving manner. Various elements appeared in logical locations and zipped around the room in a convincing way. This meant Death Eaters flew to various spots, and different kinds of magic and mayhem exploded around the spectrum. The track meshed together in a splendid way to create a stunning sonic impression. Audio quality always excelled as well. Effects were accurate and bold, with clear highs and deep lows. Music showed nice range and punch, while speech seemed concise and distinctive. This was probably the best Potter soundtrack to date, as it was a total winner. How did this 2012 Blu-ray compare to the original Blu-ray from 2011? Both were identical – literally. The 2012 Ultimate Edition simply repackages the 2011 release’s movie disc. The UE also replicates the 2011 release’s extras and adds some new ones – sort of. 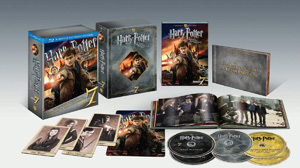 This set’s third disc replicates a platter from September 2012’s super-deluxe –and super-expensive - Harry Potter Wizard’s Collection. The UE offers these for the first time outside of that $500 package, though. On Disc One, we open with Maximum Movie Mode. Actor Jason Isaacs introduces the piece, and we also hear from producers David Heyman and David Barron, production designer Stuart Craig, makeup effects supervisor Nick Dudman, director David Yates, and actors Tom Felton, Nick Moran, Daniel Radcliffe, Emma Watson and Frank Dillane. These cover deleted scenes, production design and inspirations, makeup and effects, cast, characters and performances, sets and locations, background/refresher from the prior films, music, and various trivia tidbits. We also find occasional excerpts from the novel that intend to help set us up for the final film. Some prior “Maximum Movie Modes” such as Watchmen offered “Director Walk-ins”. These would shrink the movie image to feature the filmmaker as he manipulated elements and explained various components. The “Walk-ins” tended to show up infrequently, so the “Modes” usually acted as pretty standard picture-in-picture features. The Hallows “Mode” consists of almost nothing other than “Walk-ins” with the participants listed. Through those moments, we see footage from the set and other components, but they remain the main focus. This “Mode” starts fairly well, as we get a reasonable amount of content through the movie’s first act. Unfortunately, the breakaways tend to dry up as the film progresses and they appear less frequently. Which isn’t satisfying. You can’t enjoy Hallows as a film with the “Mode” activated; it’s just too disruptive when it appears. You also will find yourself impatient as you await the next component; without a way to jump ahead, some long gaps appear. Diehard fans will still want to go through the “Mode”, as it has some enjoyable content, but it comes with a frustrating format. We can check out the six Focus Points on their own or as branches of “Maximum Movie Mode”. These include “The Last Days of Privet Drive” (2:36), “Hagrid’s Motorbike” (4:01), “Magical Tents!” (2:18), “Death Eaters Attack Café” (2:51), “Creating Dobby and Kreacher” (3:48), and “The Return of Griphook” (3:45). In total, they run 19 minutes, 21 seconds, and across them, we hear from Yates, Radcliffe, Heyman, Craig, Watson, Dudman, special effects supervisor John Richardson, stunt doubles Joanna Whitney, Nick Chopping and Marc Mailley, 2nd unit director Stephen Woolfenden, set decorator Stephenie McMillan, 1st AD Jamie Christopher, Framestore animation supervisor Pablo Grillo, chief mould maker Jamie Iovino and actors Richard Griffiths, Fiona Shaw, Harry Melling, Julie Walters, Rupert Grint, Warwick Davis, Toby Jones, Diane Gibbins, and Bindi Johal. They look at shooting the final scenes at the Durley residence and the relationships among the actors, stunts, action and effects, set and production design, camerawork, cast, characters and performances. The “Points” exist as quick, tangential featurettes and don’t intend to tell a complete story; they’re kind of video footnotes, really. In that regard, they satisfy. While they’re never particularly impressive, they’re consistently enjoyable and give us some nice tidbits. Disc One opens with ads for the Harry Potter “Ultimate Editions” and the Lego Harry Potter videogame. Disc Two delivers a DVD Copy of Part 1. This includes a few “Additional Scenes”, so it’s not a barebones affair. More supplements show up on Disc Three. 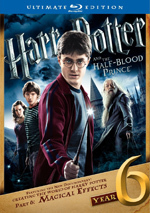 Creating the Magical World of Harry Potter Part 6: Magical Effects runs 47 minutes, 28 seconds and features a conversation between author JK Rowling and screenwriter Steve Kloves. They discuss aspects of the novels, their adaptation to the screen, and their thoughts about character/story elements. 10 new Featurettes follow. These include “Harry Potter: On the Road” (19:37), “The Return of the Order” (5:35), “Scabior and Greyback” (4:10), “Dobby’s Farewell” (4:28), “The Look of Bill Weasley” (3:41), “The Weasleys” (3:33), “The State of Evil” (9:58), “The New Guys” (7:06), “One Book, Two Movies” (4:38) and “The Wizarding Prop Shop” (5:28). Across these, we hear from Heyman, Watson, Grint, Radcliffe, Barron, Walters, Yates, Lynch, Powell, Isaacs, Domhnall Gleeson, Felton, Nighy, Bohanna, set decorator Stephenie McMillan, production designer Stuart Craig, location manager Sue Quinn, special effects supervisor John Richardson, costume designer Jany Temime, and actors Bonnie Wright, Rhys Ifans, Brendan Gleeson, David Thewlis, Natalia Tena, George Harris, Andy Linden, Nick Moran, Dave Legeno, Toby Jones, Oliver and James Phelps, Ralph Fiennes, Helen McCrory, Helena Bonham Carter, and Clemence Poesy. The next five featurettes repeat material from the original Blu-ray. These include “The Seven Harrys” (5:29), “On the Green with Rupert, Tom, Oliver and James” (13:38), “Dan, Rupert and Emma’s Running Competition” (2:45), “Godric’s Hollow/The Harry and Nagini Battle” (6:00), and “The Frozen Lake” (4:10). During these, we find notes from Radcliffe, Watson, Yates, Barron, Heyman, Grint, Felton, Craig, McMillan, Christopher, Powell, Linden, the Phelps brothers, Burke, visual effects producer Emma Norton, VFX previs animation supervisor Ferran Domenech, and actor Hazel Douglas. Eight Deleted Scenes occupy a total of 10 minutes, 54 seconds. We see “The Burrows Shed” (0:41), “The Dursley House” (0:52), “Dudley and Harry” (2:05), “The Granger House” (0:27), “Ministry of Magic Lifts” (1:51), “Tent” (1:38), “Rabbit Chase in the Forest” (1:28), and “Ron and Hermione Skimming Stones” (1:52). The first few are the best; in particular, “Dursley” and “Dudley” flesh out the brief departure sequence we see at the start. Though I suspect the filmmakers thought those two would slow down the opening, I would’ve liked them to make the final cut; they add even more emotional resonance to the film. Four ads appear within Trailers. In addition to both the teaser and theatrical trailers for Part 1, we get “Behind the Soundtrack” (3:51) and a promo for The Wizarding World of Harry Potter (6:25). “Soundtrack” features Barron, Heyman, and composer Alexandre Desplat. We get a few notes about Desplat’s work on the film, but don’t expect much depth; the piece remains pretty shallow. “Wizarding” takes us to the June 2010 grand opening of the new development at Universal Studios Florida. Various members of the cast attend and we learn more about the park’s design. This is pure promotion, though it’s good promotion; it makes me want to visit. The package also provides a few materials not found on various discs. A 52-page Photo Book presents a variety of images. Called “Creating the World of Harry Potter Growing Up”, it mixes production/behind the scenes photos and movie stills. These span many years and don’t just concentrate on Hallows. This is a good little book with some interesting images. Four Character Cards finish the package. Prisoner includes cards for Bellatrix Lestrange, Ginny Weasley, Neville Longbottom, and Lord Voldemort. On the positive side, these are better constructed one might expect; they’re thick and sturdy. On the negative side, they don’t really tell us anything. One side shows a black and white photo of the character, while the other sticks with extremely basic facts. Maybe fans will dig these, but they seem superfluous to me. Not only does Harry Potter and the Deathly Hallows Part 1 set up the series’ finale, but also it stands on its own as arguably the best film of the first seven. It provides a grim experience that proves to be tight and often moving. The Blu-ray comes with excellent audio and a good collection of supplements, but visuals tend to be awfully murky in dark shots. 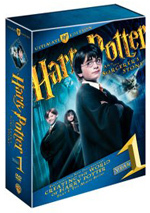 Casual fans should be happy with the original Blu-ray, but this Ultimate Edition offers a nice experience for more dedicated Potterites. 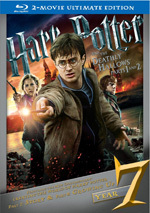 Note that this “Ultimate Edition” of Deathly Hallows Part 1 can be purchased only as part of a 2-movie collection with Deathly Hallows Part 2. While the other Potter films earned individual UEs, that’s not the case for the final two chapters. On one hand, this makes sense – would any fan only want Part 1 or Part 2? – but on the other hand, it seems presumptuous. Well, at least it gives buyers a discount. Prior individual UEs listed at $49.99 each, while the dual Part 1/Part 2 UE goes for $64.99, or about $35 less than it would’ve cost to get separate sets.